Typically "jam sessions" are fun for the musicians doing their thing, but most wouldn't want to listen as the often directionless playing can be tedious. This 45 side distills what is, in my opinion, the absolute greatest example of the brief flash of inspiration that can result in such a thing. 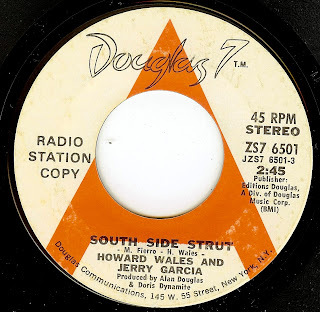 Veteran session/ touring keyboard player Howard Wales (The Four Tops, James Brown, The Box Tops, etc) made his home in San Francisco in the late 60's, and began playing in the clubs such as The Matrix that hosted a jam night where the heavy hitter of the SF scene held court. Howard and Jerry Garcia clicked, and they cut an LP that was released in 1971 (of which this single is extracted). The duo (joined by an excellent rhythm section), perfectly match a SLAMMING organ driven funk jam with Garcia's spacy guitar being channeled in from another dimension. Born Richenda de Winterstein Gillespie in the affluent county of Surrey (outside London), the persona of Dana Gillespie was born when, at age 13, she attended The American Folk Blues Festival in 1962. Dana began frequenting the Marquee club as a young teen (and was offered a contract by The Yardbirds manager which she declined), this precocious young singer and actress fell into a friendship with Donovan (Leitch). 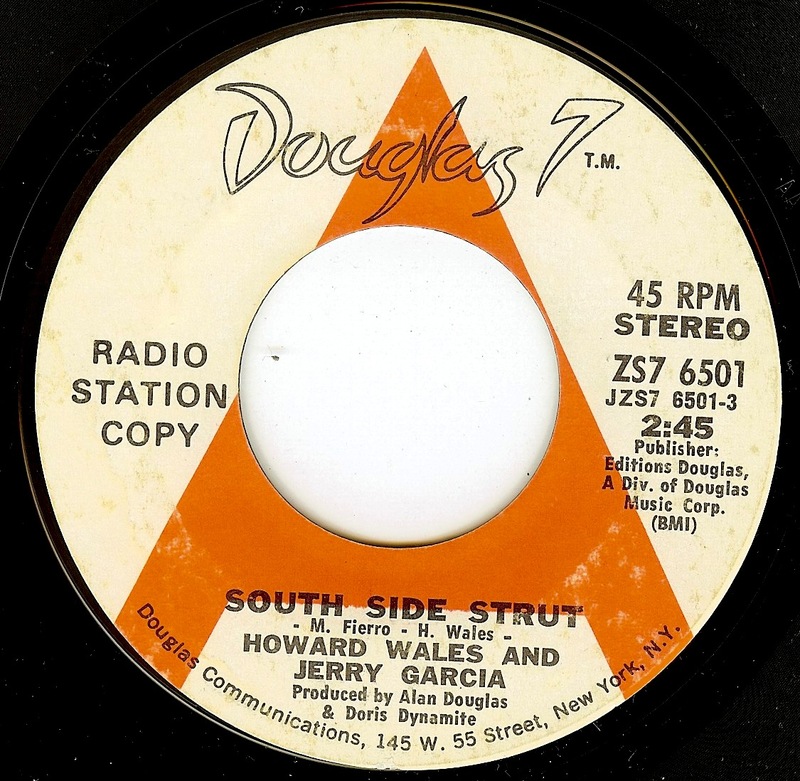 Donovan assisted her from the beginning (her recording debut was in 1965), and in 1968 wrote this song exclusively for Dana that was poised to be a smash hit. Not only was the single (and subsequent LP) amazing, but Dana was a gorgeous young woman. For whatever reason, the record sis not become a hit but it has taken on a life of its own as one of the ultimate examples of (late period) British psych-beat. Listening to the seasoned voice on this record, it's hard to believe that Dana was only SEVENTEEN years old when she cut it. 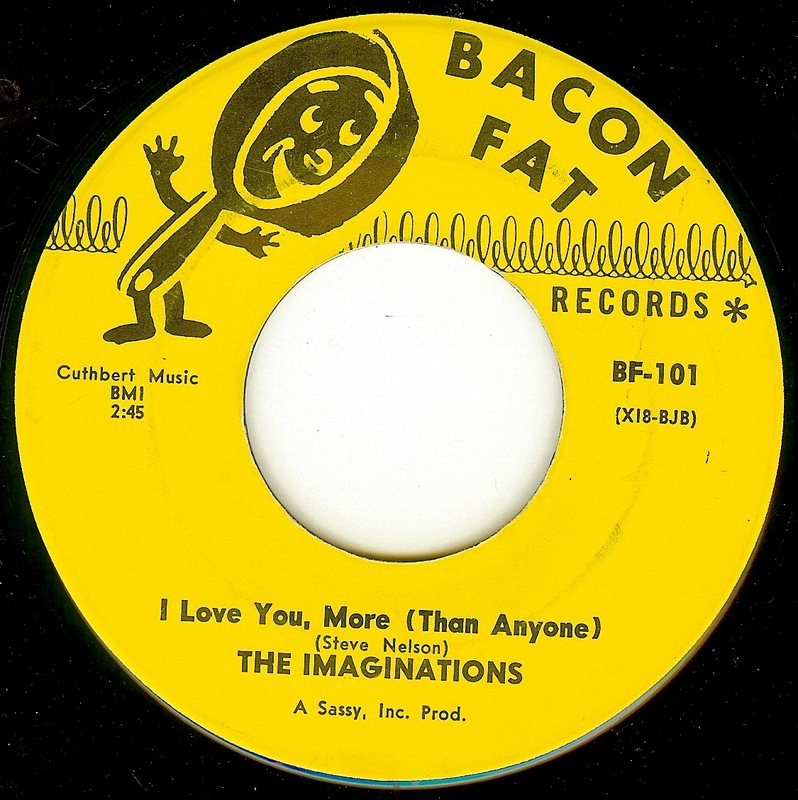 This 45 has been a holy grail for me for years; I've had the LP for ages (the superb Foolish Seasons) but this was another record that I've consistently been outbid on whenever it came up for sale. Now to snag the equally excellent (and impossibly scarce) American cover by Karen Verros and my mind will be all set. Dana's career found her continuing on through the present day as a singer (blues) and actress (she starred as Mary Magdalane in the original London cast of Jesus Christ Superstar). First off, today's post is dedicated to today's Supreme Court ruling and the prevailing power of equality. Hats off! 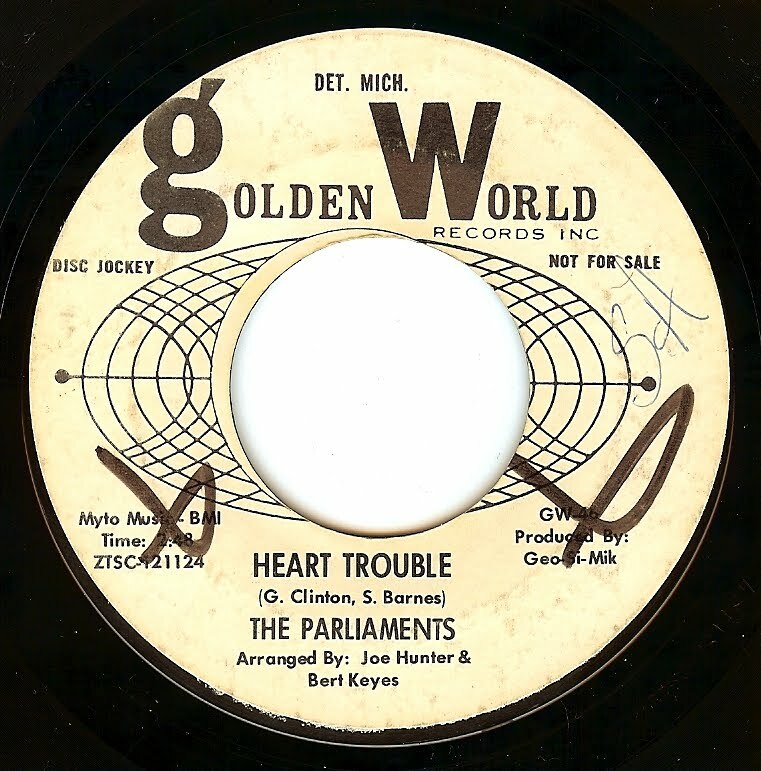 Chicago's unbelievably great vocal group is best known for their superlative sweet soul ballads of the early '70's, but they made several out and out BURNERS, of which this is one of the finest. 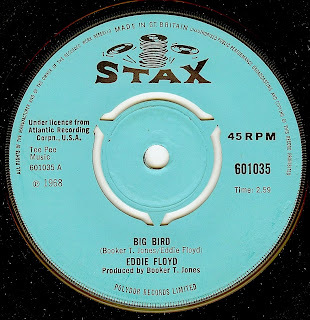 Happy birthday to the GREAT Eddie Floyd; what better opportunity to re-post one of the earliest daily 45's I ever posted, the mighty "Big Bird"! 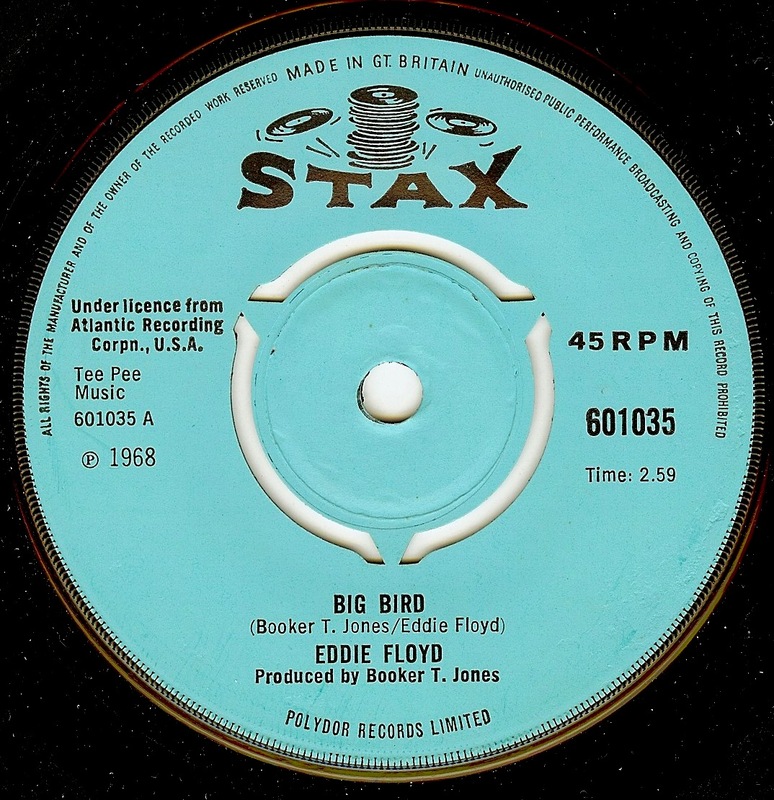 "Big Bird" was also one of the final blue label Stax singles (before they broke from Atlantic and went independent again), and also represents an end of sorts to the vibe of the blue label records. 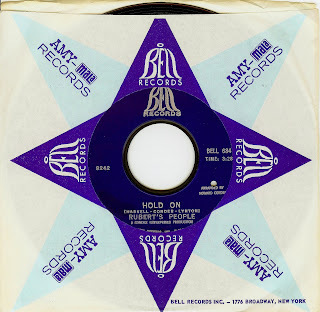 "Big Bird" is one of the hardest hitting soul 45's of the '60's (Steve Cropper's guitar riff is SO RAW), and its no surprise that this record was especially popular in the UK (witness my English copy with that gorgeous label). The darker side to the record is that, legend has it, Eddie Floyd wrote the lyrics at Heathrow Airport, waiting to fly home for the funeral of Otis Redding. Undoubtedly soul music itself was changing, but the death of Otis Redding also changed the mood at Stax considerably. 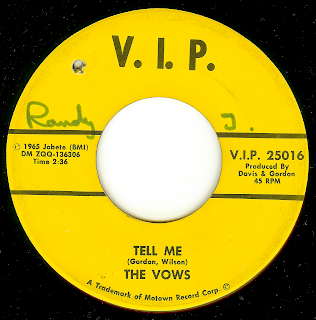 Of course they recorded and released dozens upon dozens of great records post-'68, but there is a considerable magic on the blue label 45's. By 1968, Eddie Floyd was a music business veteran of 13 years, having co-founded The Falcons in 1955. eddie was signed to Stax in 1965 and the label used his considerable talents as both a performer AND songwriter to full capacity. Eddie has written some of the most powerful soul classics in the history of the music; whether recorded originally by himself ("Knock On Wood"), or by others ("Ninety-Nine And A Half Won't Do"), these songs are the amazing legacy of a legend. 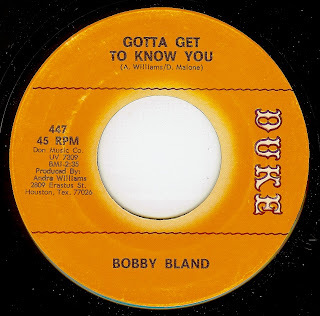 Whoever coined the nickname "the Sinatra of the blues" for Bobby Bland couldn't have been more correct; during his golden years of the 50's and '60's, there were no better blues vocalists than Mr. Bland. Sadly, his voice had deteriorated quite a bit in his later years, but Bobby Bland still managed to deliver the goods on stage up until the end. Bobby's discography is just as large as the influence that he cast through blues, soul (and beyond)- it wasn't easy picking only four records to share here. In addition to his oodles of 45's (and 78's), his LP's Two Steps From The Blues and Here's The Man are two of the greatest blues LP's ever cut to wax. Bobby grew up in Memphis, and like so many other musicians who call that city home, Bobby's music combined elements of so many different styles that limiting his work to the label "blues" is both unfair and misleading. While his recording career began in the early '50's, he was drafted in to the army which took him out of circulation for several years. When he returned to civilian life, not only did his records (and his vocal style) hit their stride, but he also worked as a chauffeur to make ends meet. 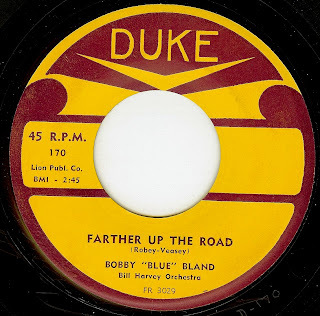 By the time "Farther Up The Road" was released in 1957, Bobby was a musician full time, and his records and live appearances were becoming very popular. 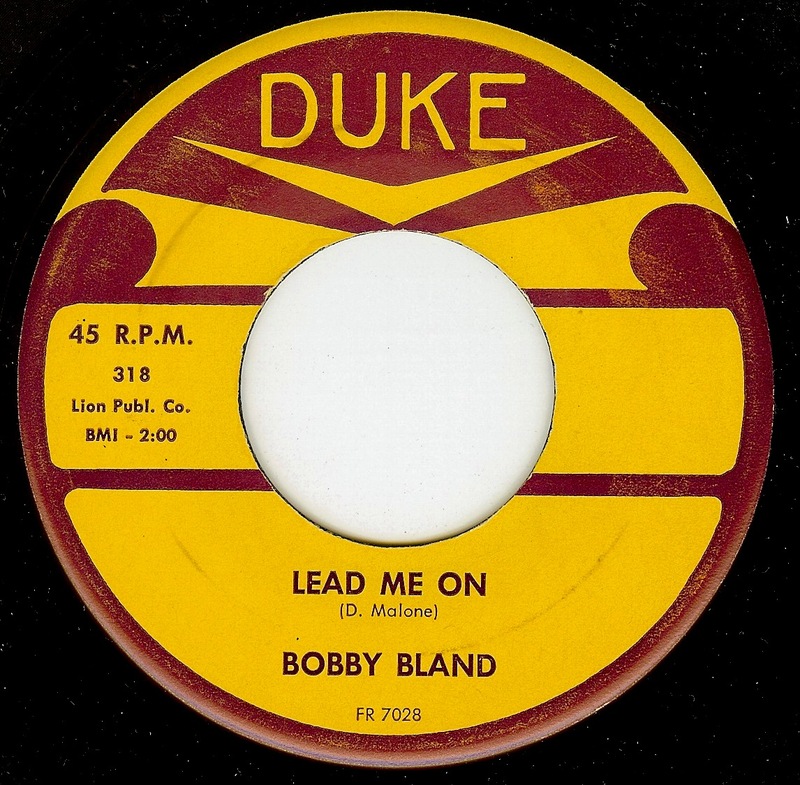 "Lead Me On" (1960) is one of the most haunting records I've ever heard; in addition to the gorgeous, aching vocal performance, the addition of strings was a brilliant and innovative move that adding an air of sophistication to the music that took it to a completely new level. "Turn On Your Love Light" (1961) is one of Bobby's most loved records, and it also became one of his most famous, thanks to the (fantastic) cover by the Grateful Dead. 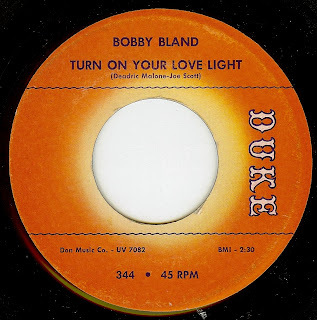 "Love Light" is one of those records that was a blueprint for the upcoming soul sounds that were just a few years ahead. 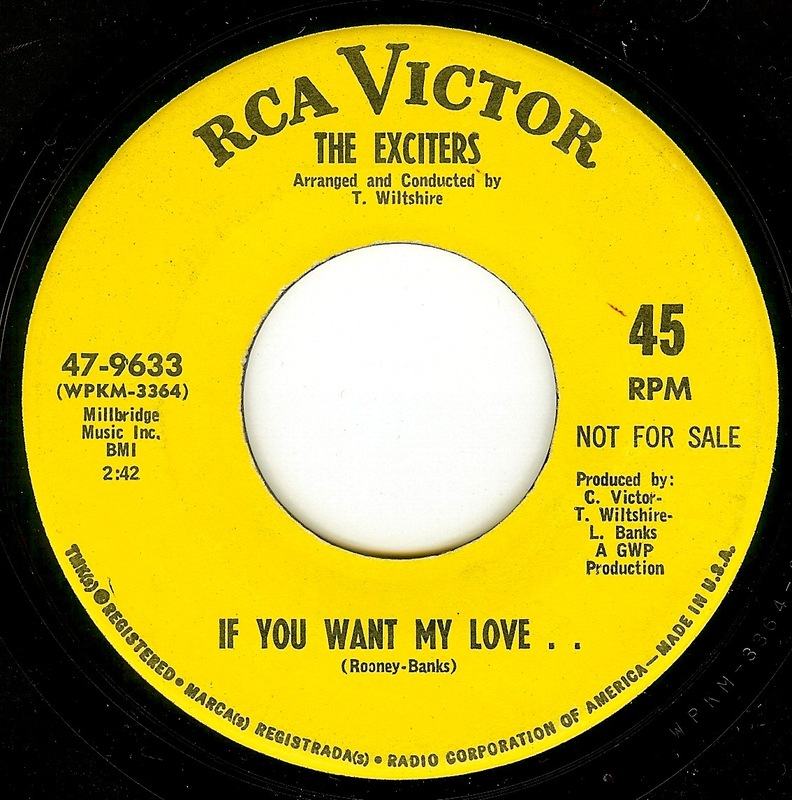 Unlike many of his contemporaries, Bobby was able to gracefully adapt to the soul style that all but swept blues aside in the mid-60's, and records such as "Shoes" (1966- a past 45 of the day) and "Gotta Get To Know You" (1969) combine Bobby's incredible vocals with a hard edged soul sound making for sublime results. 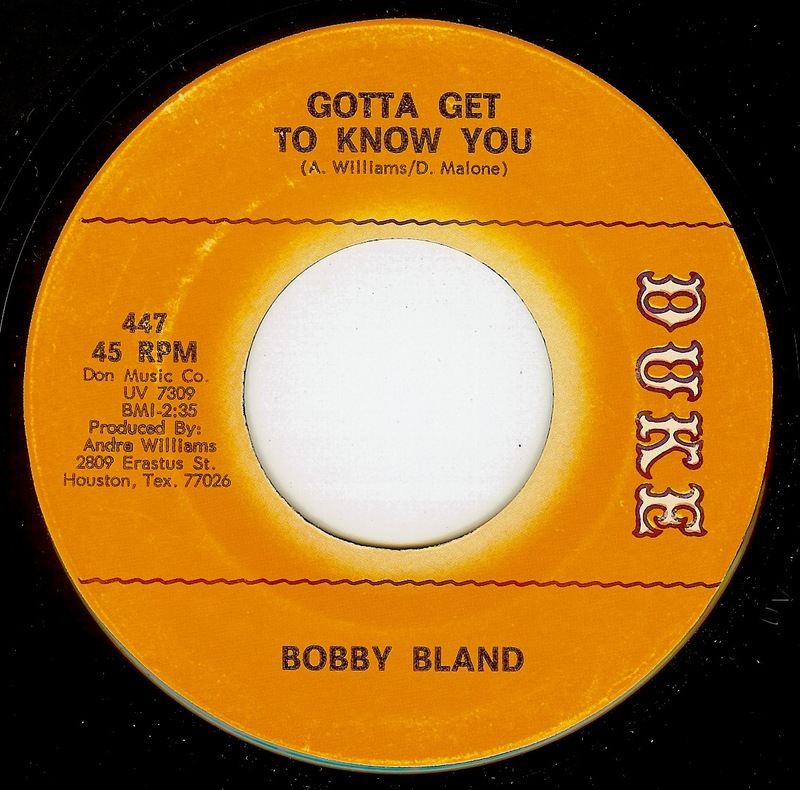 Sadly, at the time "Gotta Get To Know You" was released, Bobby's band had disintegrated, and he was deep in a battle with the bottle. Fortunately, the man was able to clean up in '71 and his LP's from the '70's and touring brought him great success. My mom took me to see him and BB King together when I was 4 years old, and that concert cut a lasting impression on my young psyche. Thank you for the music, Bobby- you were pure class. Eaton and Knight's harmonies are absolutely other worldly, and Bridges' lead is gritty but in absolute control. 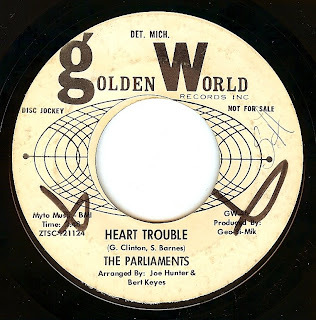 The trio went on releasing a few more records under this name, but also shared their songwriting talents with other artists, and worked steadily as backing vocalists (mainly for Holland-Dozier-Holland's post-Motown productions). 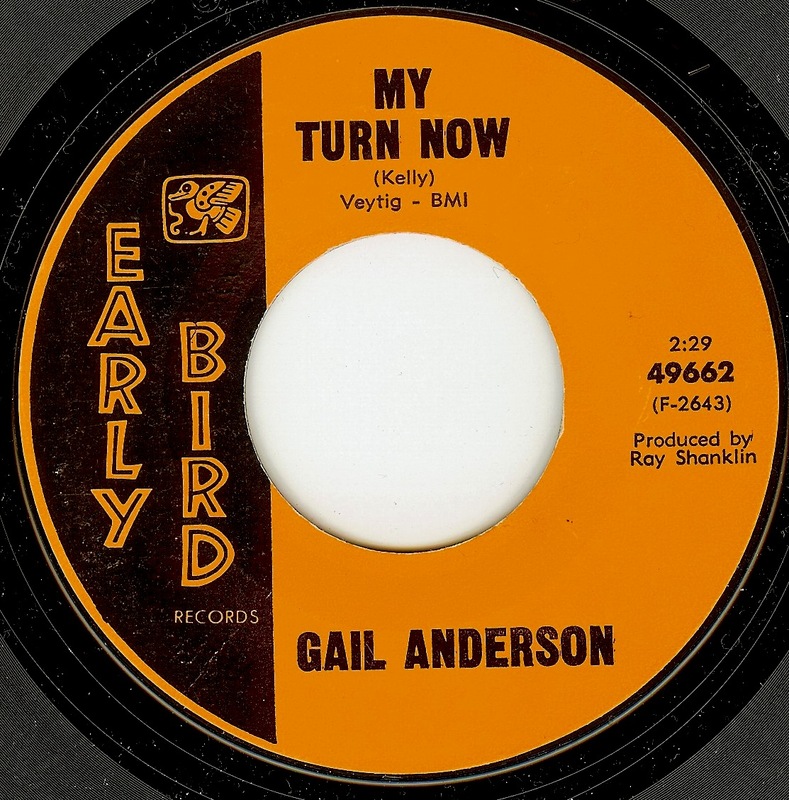 Phew, Gail Anderson absolutely WAILS on this track! This is an example of a side where the song itself isn't that great, and in lesser hands would have been a relatively boring record. However, the vocal just pushes this song into a whole other status. Early Bird was an offshoot of Fantasy Records (Berkeley) so it's relatively certain that this is a bay area track. Not much is known about Gail Anderson, other than that she was probably from SF/Oakland. 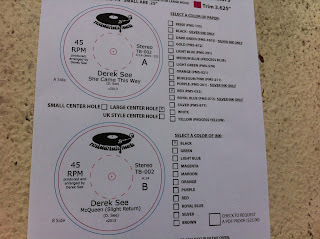 One thing that's certain is that she made far too few records! While Sharon Tandy's version is definitive, this (male) take is pretty damn swell, as well. 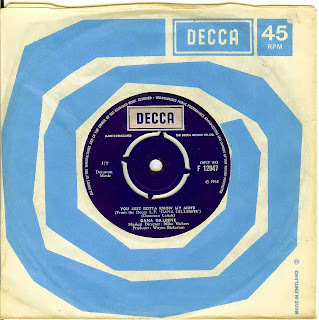 Turns out that Rupert's People had a very strong connection to the Sharon Tandy record, as they were the same backing group, and they were one and the same as the legendary UK freakbeat group The Fleur De Lys. For very strange reasons, Fleur De Lys recorded a few sides as Rupert's People (one can read the whole saga here). Here, the band lowers the key a bit, changes the middle eight of the song, and increases the HEAVY aspect, but keep it groovin' and groovy amid the sludge. Daily 45 "mixtape" on Sirius Radio, this Friday! I'm stoked to have been asked by Aquarium Drunkard to host their weekly show on Sirius; it's gonna be two hours of the finest soul sounds! It airs both at 12:00 PM EST and then again at 12:00 AM EST this FRIDAY on channel 35. 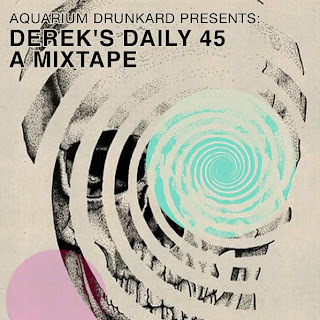 One can listen free with a three day trial at Sirius, OR, when the show is reposted at the Aquarium Drunkard site. 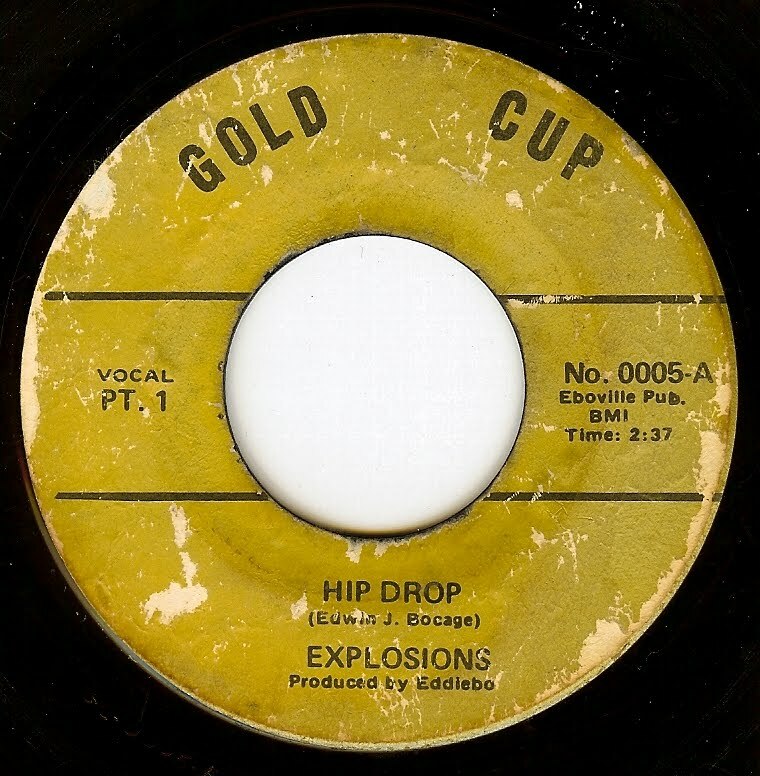 Five years after their final big US hit ("He's Got The Power"), The Exciters released a one-two punch that peaked with the release of "Blowing Up My Mind". 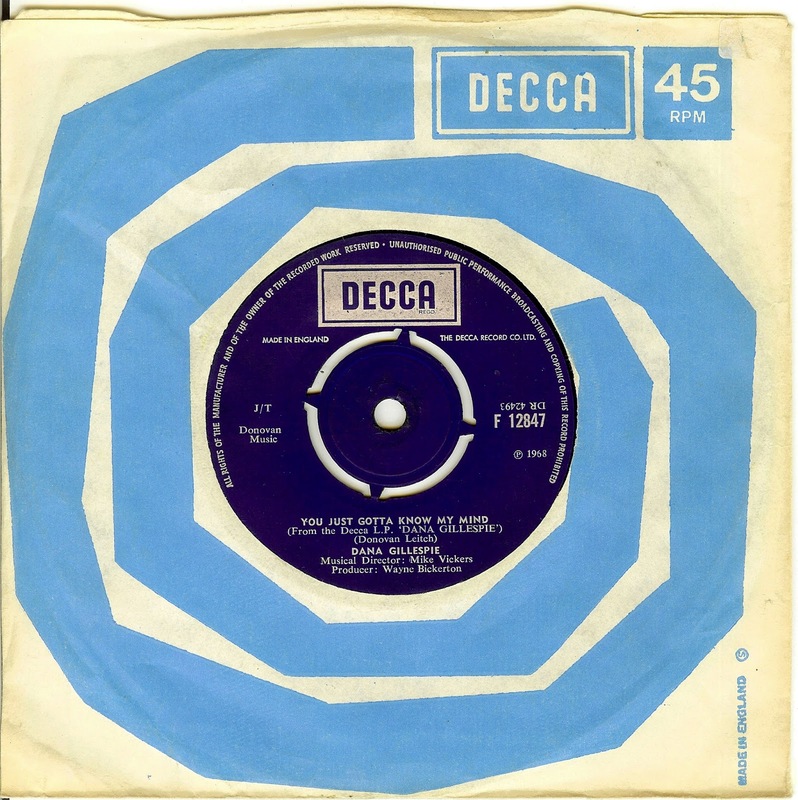 "Blowing" was one of the first 45's of the day on this site, and while it wasn't a chart hit it quickly became a stomping anthem on the Northern Soul scene of early '70's England. 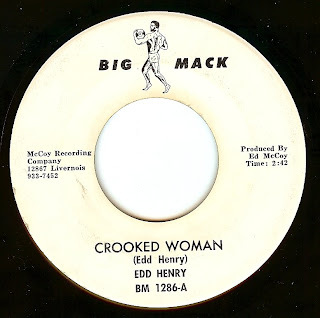 While that record gets the attention it so rightly deserves, the groups' OTHER single on RCA tends to get overlooked but it's a stone groove as well, with another powerful lead vocal from Brenda Reid, excellent harmonies and a red hot guitar break from Brenda's husband Herb Rooney. Nope, there's no speed manipulation here...This record really is THAT fast. 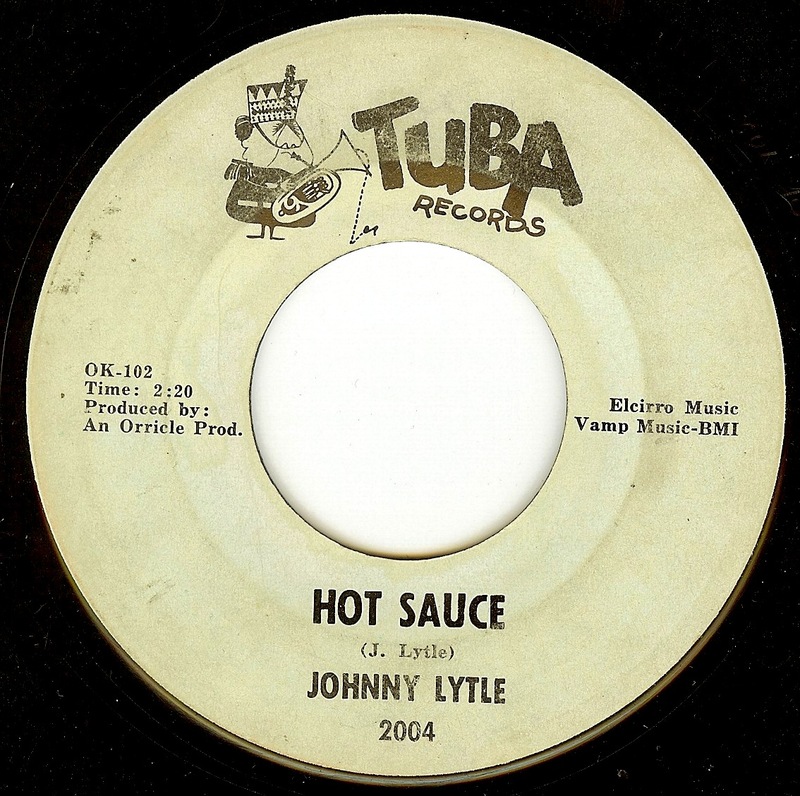 Johnny Lytle is the man playing the vibraphone here, and his speedy hands caused jazz vibes legend Lionel Hampton to call Johnny the world's greatest vibraphone player. Now, speed in itself certainly doesn't make a great musician or record (this is music, not sports after all) but something about this side is just so damn cool. In addition to the great vibes work, I love the lightning like organ stabs, and the way the drummer keeps it swingin'. The Creations were vocalists Charles Boyd, Eugene Amos, Michael Wiggins and Gerald Dickerson, and they released some wonderful records during the late '60's/ early '70's Chicago vocal group movement. Here, the group (with such lovely vocals) takes on a very serious subject- the draft was gutting the male population of a huge proportion of inner city and less privileged youths, and so many young men didn't return home. In this song, they gently urge their young lady friends to simply remember them, and it gives me a big lump in my throat thinking about all the senseless killing from ANY war and the memories of those (with their whole lives ahead of them) left behind. 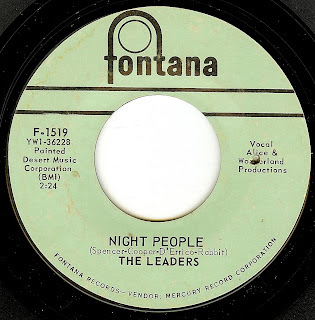 I'm afraid that I know nothing about this group, and it seems to be a one-off, both from the band AND the label (and what cool label design). I'm almost certain that it's not the same Imaginations that recorded in the early '70's. Whatever the story, it's a lovely record with some gorgeous Impressions style backing vocals and a nice gritty lead. Every time I think I've heard EVERY 100 mile-per-hour stomper cut in the 60's, another one seems to magically appear in my life (I hadn't heard this jam until recently). And I am very thankful for that. 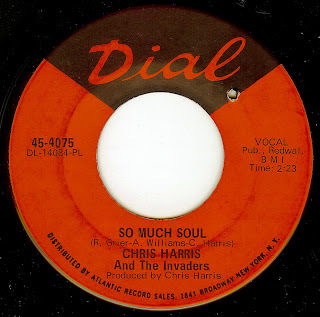 Chris Harris was a member of The Delacardos from North Carolina (their "She's The One I Love" was a past 45 of the day), and released three records on Dial then seems to have faded out of the music scene. As per the lyrics, they may not "need" a band, but the band sure sounds EXCELLENT here. New York City-born Tommy Vann settled in Baltimore after a stint in the Marines in the late 50's. Going off of his webstie bio, Tommy was a born performer and even as a toddler was performing at family get togethers. 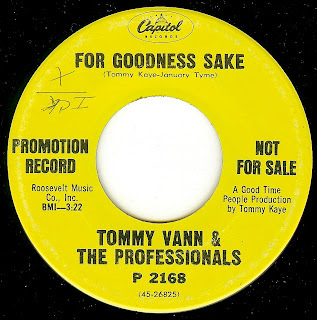 Using the names "Echoes", "Professionals", and finally "Admirals", Tommy and his band were a staple on the Atlantic coast live music scene, cutting a few records along the way. 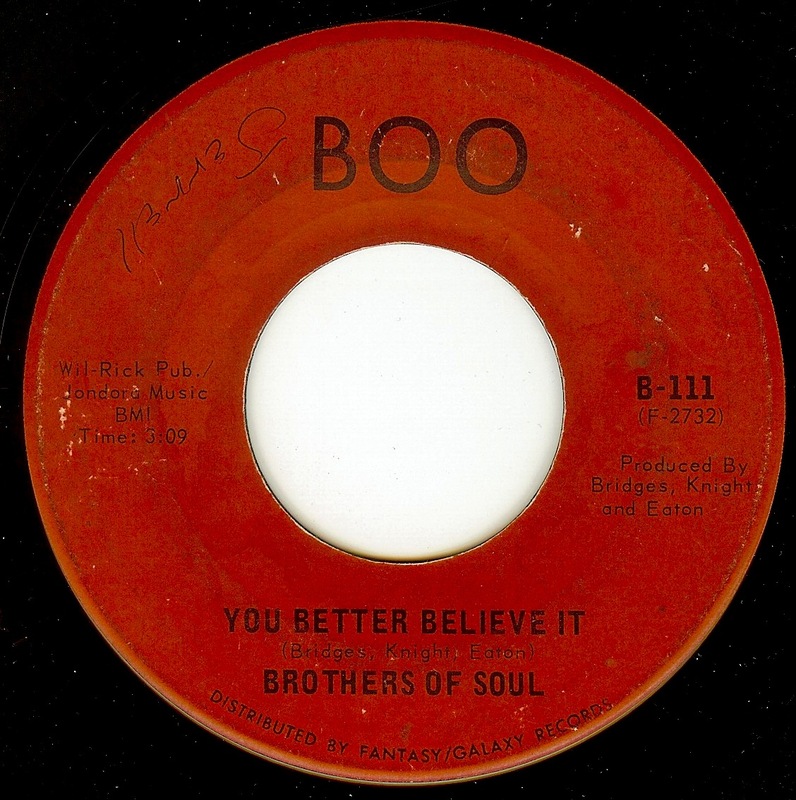 This track is the flip side to the groups' near hit "Soul Sister Annie", and I love the heavy dance groove topped with Tommy's sweet blue eyed soul falsetto. Around 1:40 in, when the distorted harmonica wails are joined by some outta site tambourine it gets downright hypnotic and lyrically frightening. 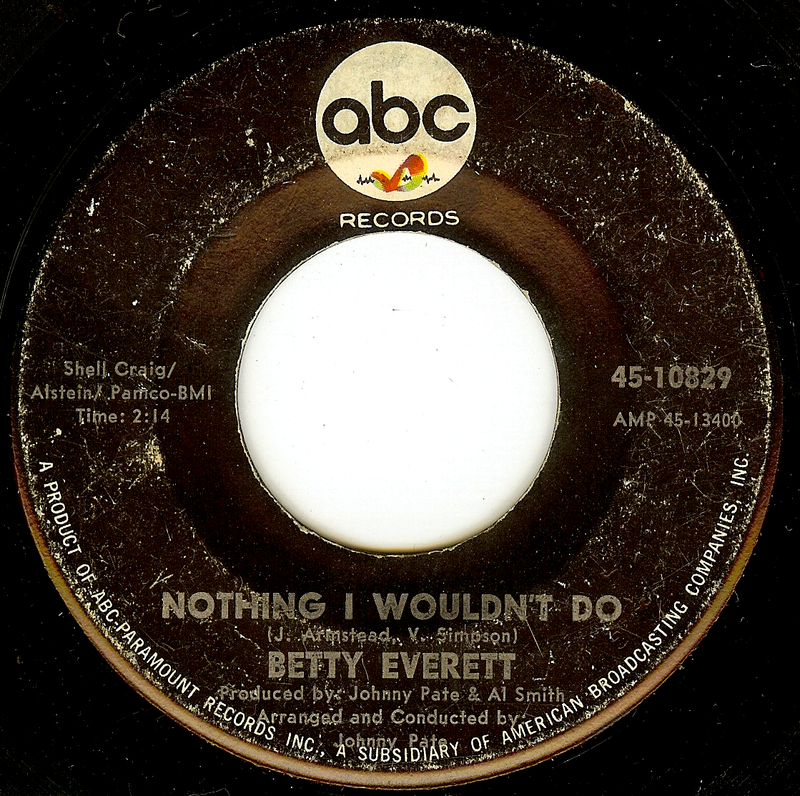 This was Betty Everett's first 45 after the closing/ bankruptcy of Vee Jay Records, which was her home for four years and the label that released her biggest hit; the immortal "The Shoop Shoop Song (It's In His Kiss)", along with "You're No Good" and several well-loved duets with Jerry Butler. 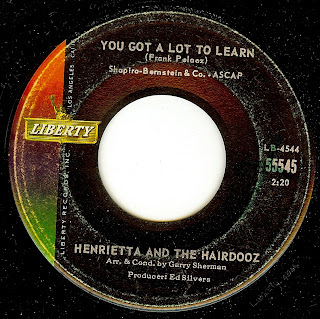 Coupled with a great song (penned by Jo Armstead and Valerie Simpson), some super production from Johnny Pate, and of course Betty's always lovely vocals, this sophisticated and swingin' song should have been a hit for Betty. 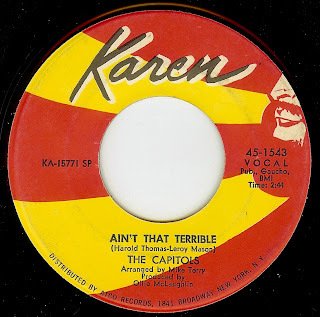 Sadly, she only had one more major hit a few years later ("There'll Come A Time"), and while she recorded throughout the 70's the records went nowhere. 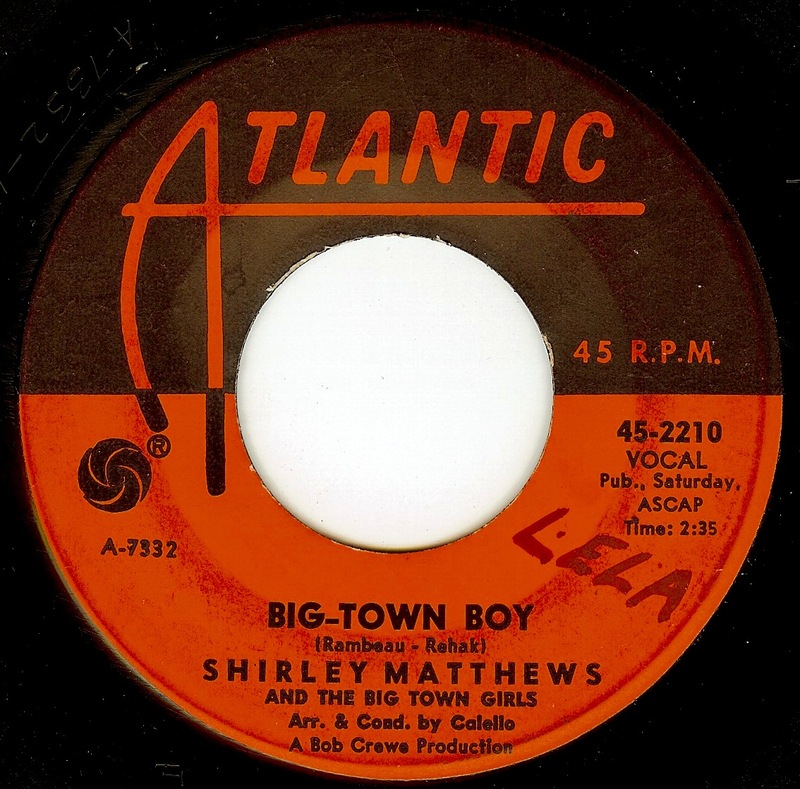 Even though the audience for the music was/is massive in the country, not many soul singers called Toronto (or Canada in general) home, making Ontario native Shirley Matthews a rare bird indeed! Her story is certainly similar to so many vocalists in that she grew up singing in her church, and as a young adult began moonlighting as a singer in Toronto clubs while working at bell telephone by day. 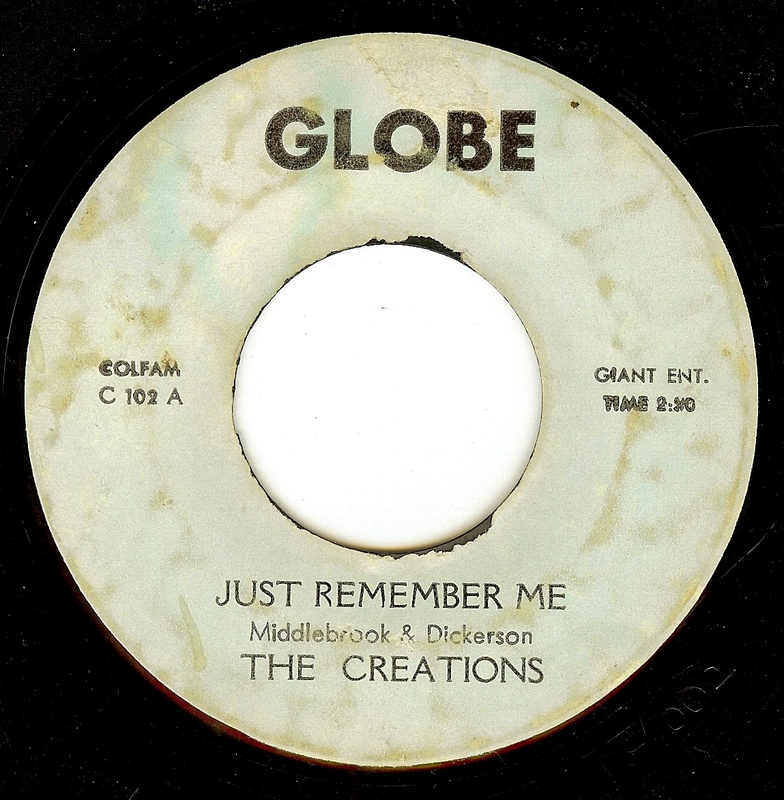 Apparently one of (New York producer) Bob Crewe's talent scouts caught her on stage and made arrangements for a session with Crewe, the results of which became a Canadian smash and a small hit in the US. 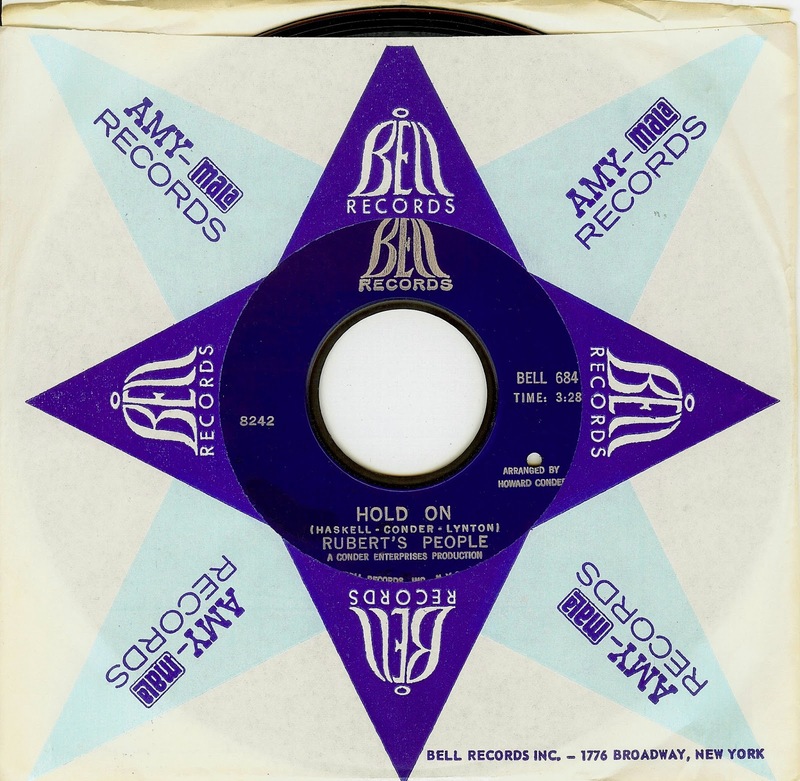 The record certainly shows a strong Motown influence, with superb energy, fantastic vocals and some almost jarring key changes that still work, defying odds. 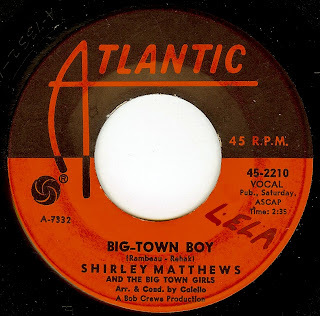 Shirley could never match its success, and by 1967 was out of the music business and managing health clubs (which she allegedly does to this very day). Some of the best executed garage rock records were cut in Texas, and this incredible track is certainly at the upper echelon of the era. Between the confident and tight musicianship and vocals and the frightening, intense lyrics, it's hard to believe that this record is the work of a teenage band- especially one from the suburbs of Fort Worth. 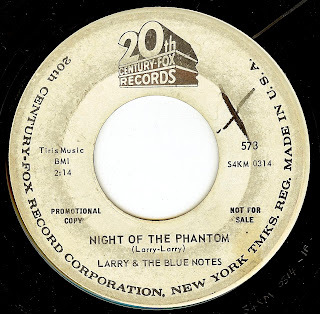 The record was initially cut as 'Night Of The Sadist", but producer Major Bill Smith made the group go back into the studio and overdub the word "Phantom" (after first suggesting "burglar") over the already recorded track each time the word "sadist" was sung. I can definitely hear the remnants of of the "s" sound of "sadist", especially with headphones. Although the word change was made as a commercial consideration (the producer felt that no radio station would allow the word sadist on the air), I think the song is WAY better as "phantom", as it invokes a certain type of imagery that makes the record even more powerful. 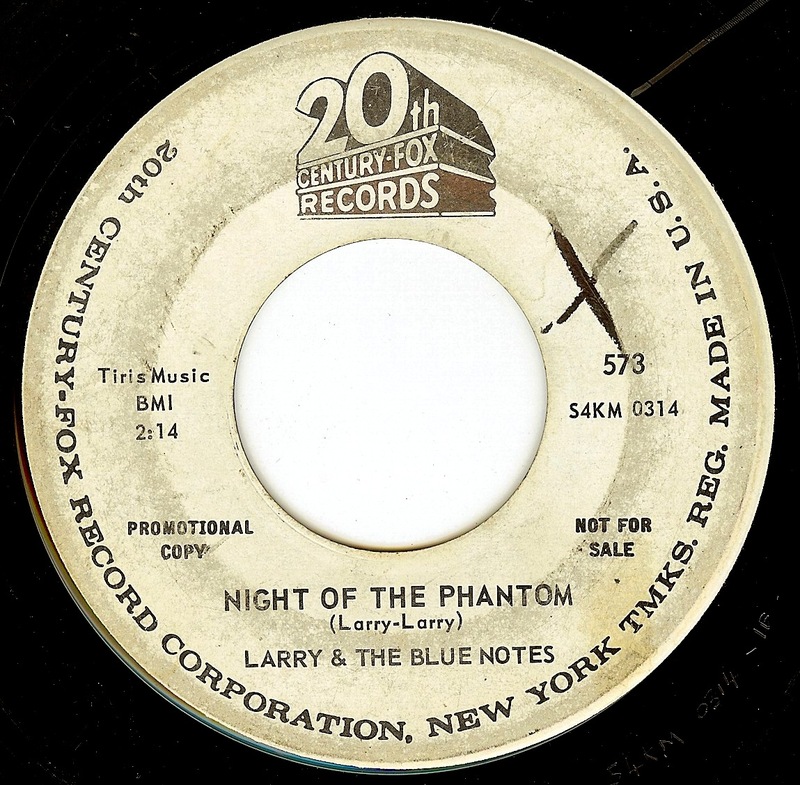 Plus, they cranked up the reverb on the "night of the phantom" lines (undoubtedly to cover up remnants of the sadist) which ends up being an ultra cool touch that just makes the record even spookier. Of course, this was EDGY stuff for 1965, and even though the record was picked up from its initial local pressing by 20th Century Fox Records, it went nowhere commercially and is a highly sought out record in either pressing. 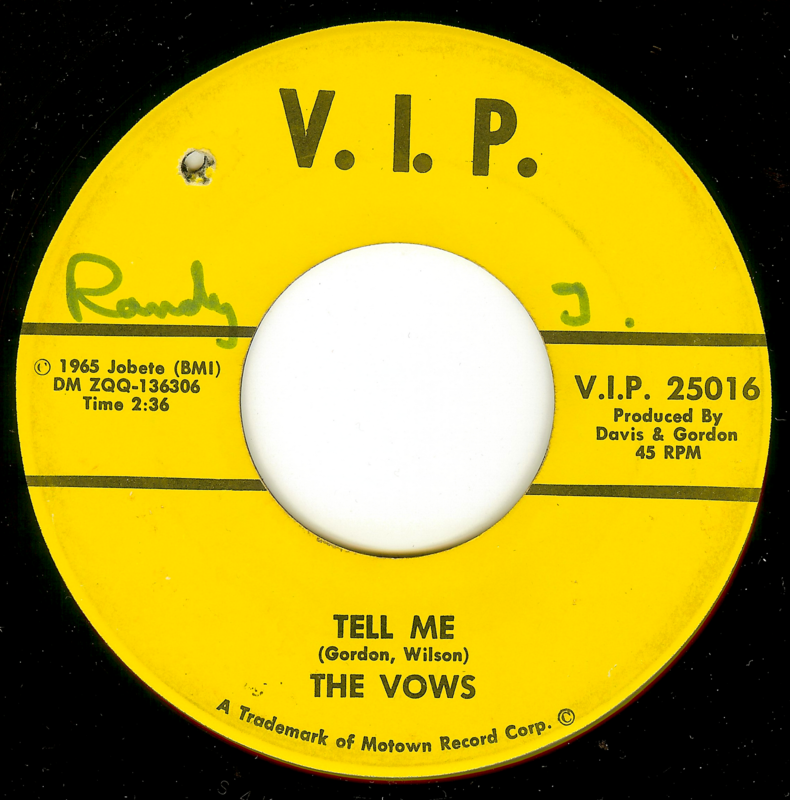 Funny how the two songwriting band members (vocalist Larry Roquemore and Larry Slater) are listed by their first names (Larry-Larry) for the writers credit. A group that called themselves The De Vaurs formed in the late '50's while the young ladies were still high school students. As was the doo wop tradition, they spent many hours perfecting their harmonies under street lamps and on street corners, eventually winning a talent contest which earned them a recording contract. Flashing forward a few years, the group was signed to a production deal which saw their name changed to Baby Jane & The Rockabyes, saw their records be released on labels such as United Artists (and their offshoot label, Liberty), with producers trying to emulate the success found on Bob B Soxx & The Blue Jeans big hit "Zip A Dee Doo Dah" with rhythm-ified versions of "How Much Is That Doggie In The Window" and "Hickery Dickery Dock". 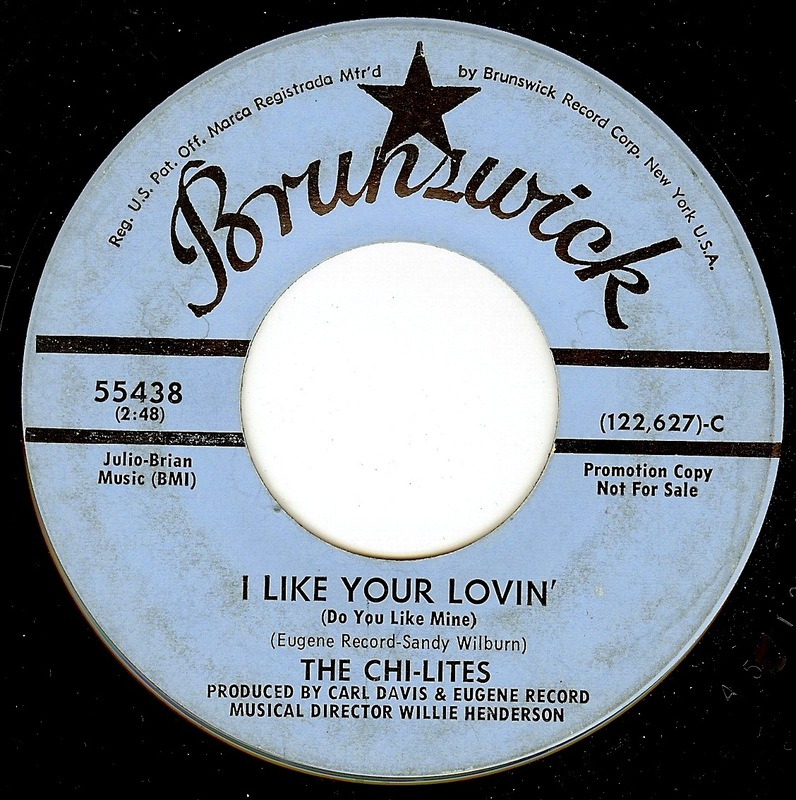 The records went nowhere, and (mostly) the same singers also recorded as The Lullabyes (who were previously featured here), The Elektras, and Henrietta & The Hairdooz. This record loses the nursery rhyme jive (luckily) and is a beautiful, serious slice of melancholy girl group magic. Fugi (or Fuji) is actually Ellington Jordan who is also known as the man who wrote "I'd Rather Go Blind" with Etta James (although her name doesn't appear on the writer's credit, due to an alleged tax situation) while he was incarcerated. 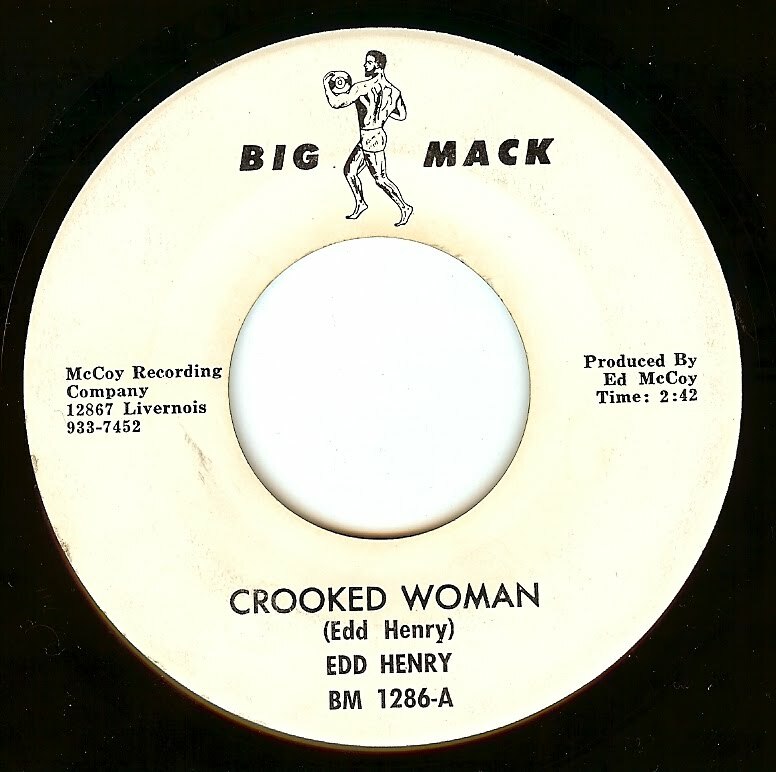 Upon his release, Ellington hooked up with Detroit psych funk band Black Merda (widely believed to be the first all black rock group), and cut several records as Fugi; the most famous of which is the frighteningly great "Mary Don't Take Me On No Bad Trip". 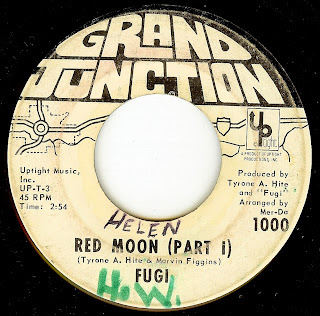 "Red Moon" was one of the final Fugi singles (and in my opinion the finest), and the group hits on an amazing groove, which is continued on to the b-side and is downright essential. Fugi returned with a new album after many years in 2005; his records have been sampled many times by hip hop artists. While Roy Redmond's 100-MPH original version of this gem of a jam is probably more well known, this Detroit-o-fied version from The Capitols is every bit as great, adding the Capitols raw, soulful harmonies and producer Mike Terry's signature conga beat. Unfortunately, The Capitols never matched the success of their 2nd single (the immortal "Cool Jerk" from '63), but they released several other white-hot records in the 60's, eventually breaking up in 1969.
my new 45: pre-orders are 50% sold out!!!! Thanks to all who have pre-ordered! We're now half way to a complete sell out! Get it while you can. 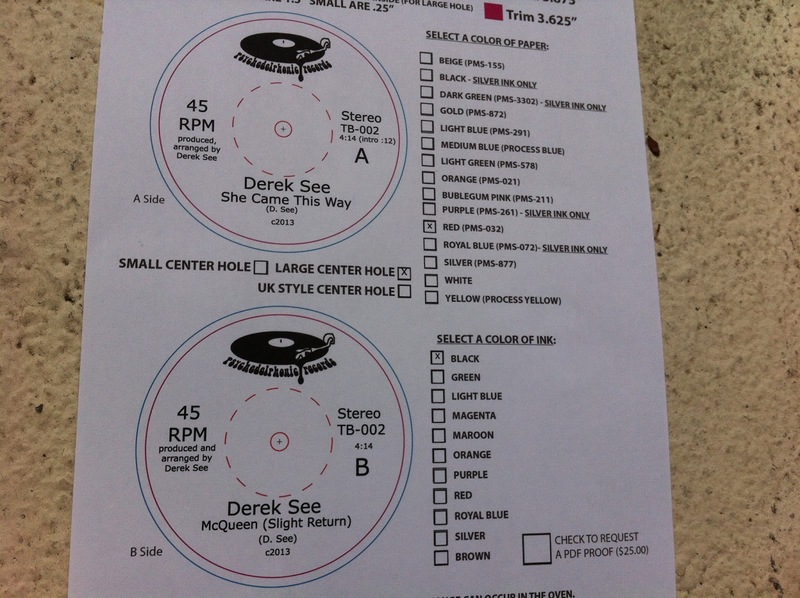 Pre-order a limited edition (100 copies only) colored vinyl 45 of Derek See's new solo outing, "She Came This Way" + "McQueen (Slight Return)"
Jimmy Nelson was became a protege of legendary r&b pioneer "Big Joe" Turner after Jimmy saw him perform as a young man. As Nelson grew up singing in church and had the voice to show it, Turner showed him the ropes of performing and the business. Even though Texas was his home for most of his life, his biggest hit records were cut in the early '50's by RPM in Los Angeles. 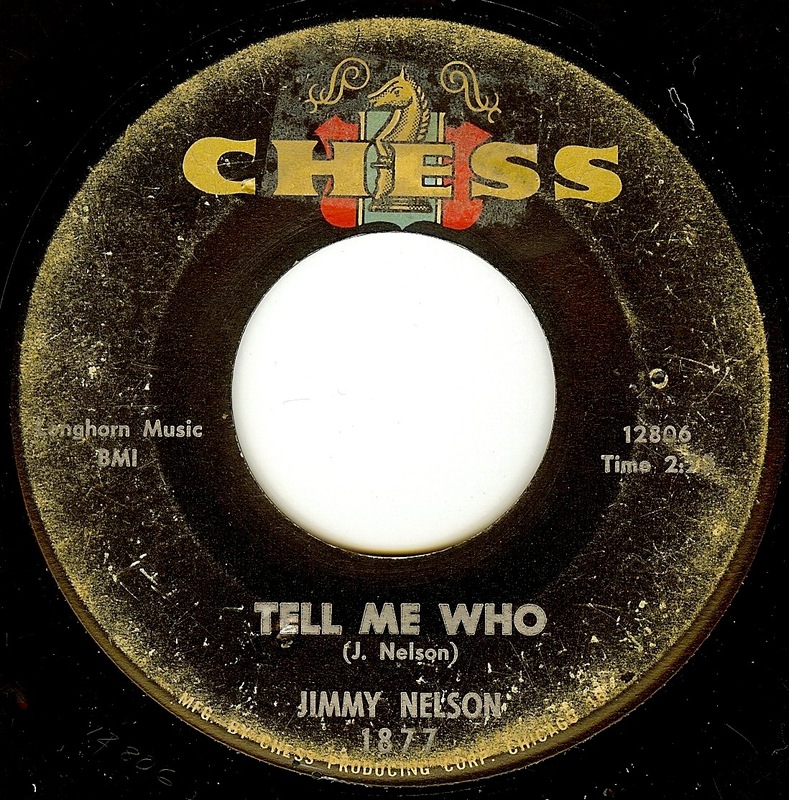 By the time of this record release, Nelson was working as a carpenter in Houston and occasionally released a record; this jumpin' track was originally issued on a small Texas label but was licensed by mighty Chess Records for national distribution. Man oh MAN does that organ SWING!!! 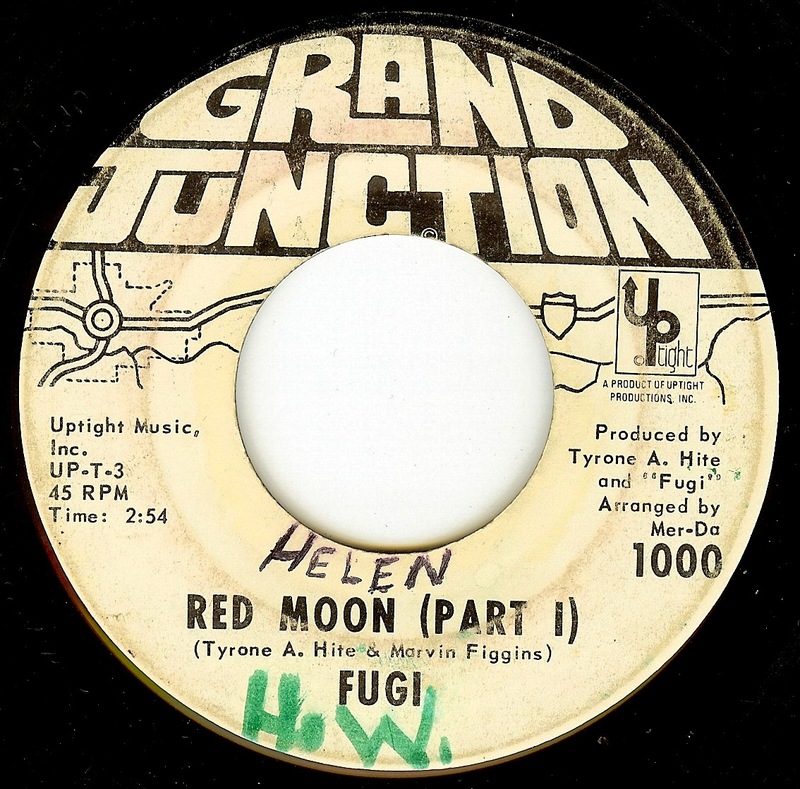 Nelson had a renaissance of sorts when he began touring and recording again in 1999, up until his death in 2007 at age 88. This record is a real "grower"; listen to it a few times and experience its subtle power; it certainly has had that effect on me! 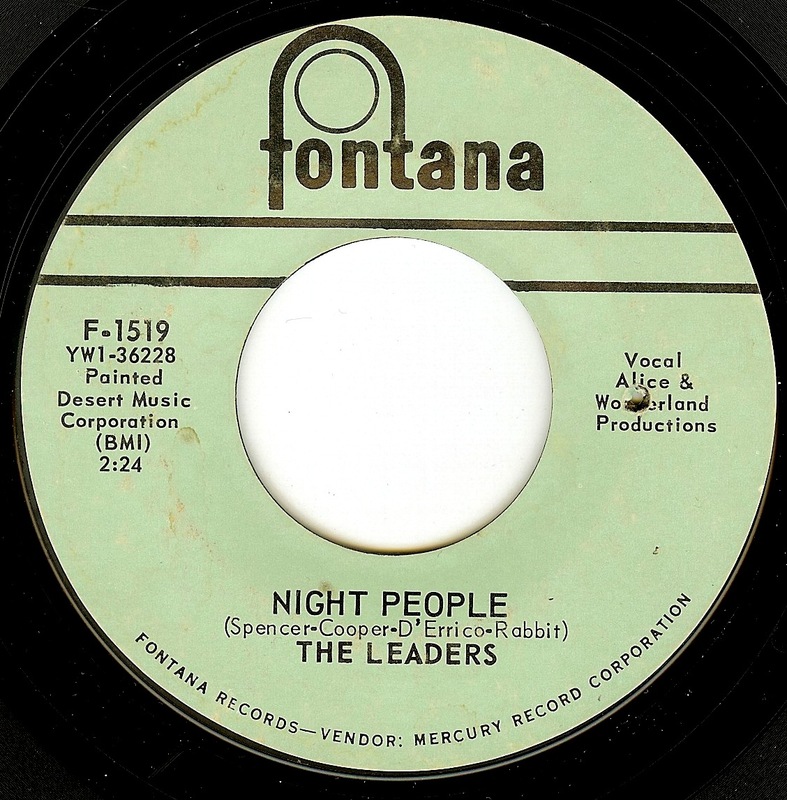 Turns out that the name THE LEADERS was chosen when this (demo) recording by a quartet of songwriters was released by the Fontana label as is, instead of being placed with another artist as intended. It's certainly easy to understand why the demo was released, as I can't imagine anyone bettering the performance. 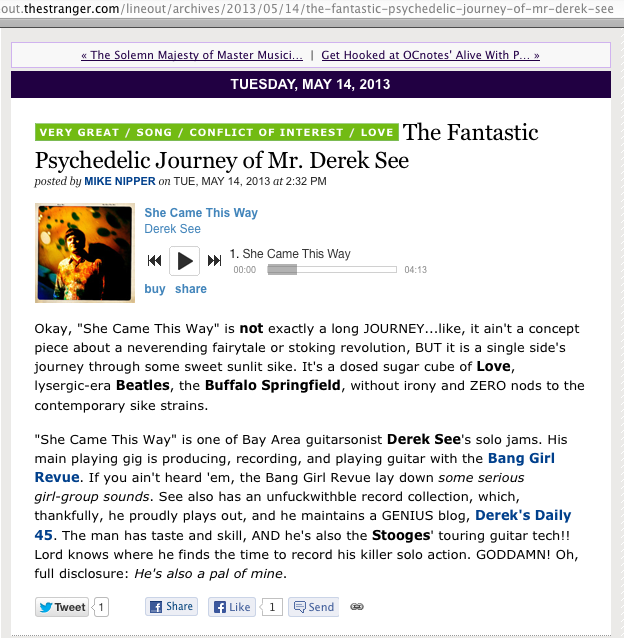 In an interview published on the Spectropop site, songwriter Carl D'Errico remembers Carl Spencer as being the lead male vocalist, but cannot remember who the (amazing) female singer is. 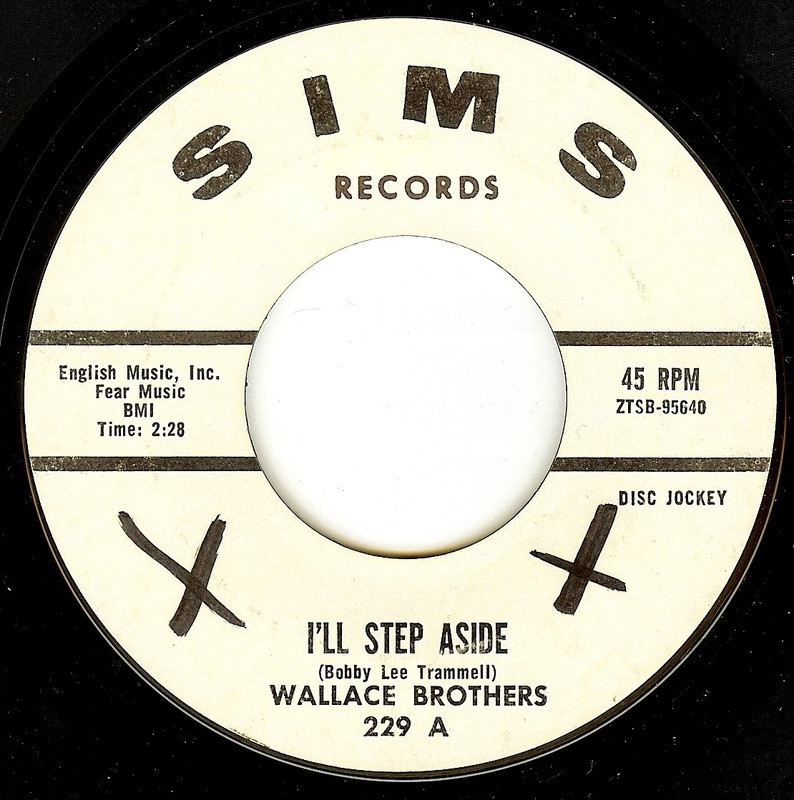 Here's a marvelous soul-waltz from Georgia's Wallace Brothers, and like their other records, has one foot in the church thanks to the raw emotion exhibited through the vocals. The disc was the fifth release from the teenage Wallace Brothers (featuring several actual Wallace brothers- including Ervin on vocals and guitar, plus cousin Johnny Simon (also on vocals). File under one of those great Los Angeles records that sounds as if it could easily have been cut in Detroit. It just has *that* sound. 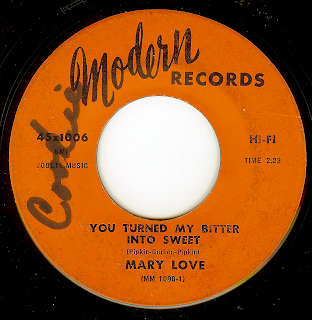 I love how Mary Love wails on the verses then backs off for such a sweet voice on the chorus (following the lyrics). Mary Love, still active in the gospel bag, is a Sacramento, California native who began recording in the mid-60's in Los Angeles. She released a handful of records through the 70's which included a few songs used in Rudy Ray Moore movies.